adobeisnotsoftware is pleased to announce our Adobe Builder Instructional Residency. 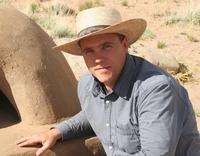 The program takes you from foundation to roof of a small adobe structure over the course of the 4-week period. The idea for Adobe is not Software’s Adobe Builder Instructional Residency program was born in 2015 with the aim of immersing architects, students and builders in modern adobe construction techniques within the context of a complete building project. The Adobe Builder Instructional Residency program provides an opportunity for people from around the world to work with adobe at real building sites in the inspiring vicinity of Joshua Tree, California. In addition to daily hands-on instruction and building site work, lectures and field trips are often held on weekends. These become an important part of the total immersion nature of the residency. Resident builders also have unlimited access to Adobe is not Software’s extensive book collection and archive. Residency staff is available to answer questions and assist you with planning your own adobe project in the off hours. Adobe is not Software is based in Pioneertown, California and maintains a casual atmosphere. It is up to the residents to find their own lodging and food for the duration of the residency. There are ample facilities directly in Pioneertown and nearby. Every effort is made to carpool to the building site each day as a group. Cost: $1500 per person for the four week, full time session.